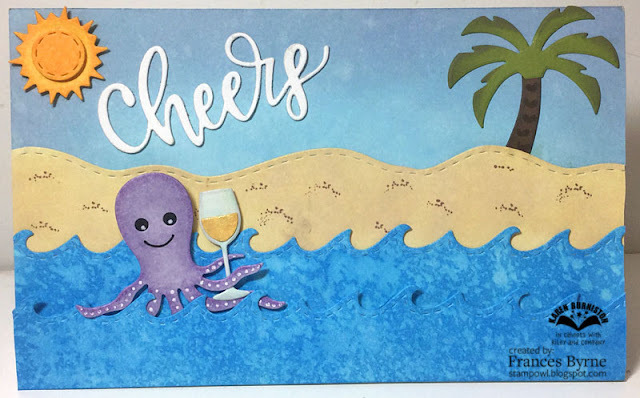 Today I am sharing a pop-up card I created recently using some of the Karen Burniston die sets that were released in August. Karen has had a lot of requests to re-release some of her older pop-up die sets. One of those was the Adirondack Chair Pop-up die set which became available in August. About 3 1/2 years ago I created a card using this die set where I created a Double Adirondack Chair Pop-up card which you can see here. Seeing the die set is available again, I decided to create a new version of this card using some of Karen's newer die sets. 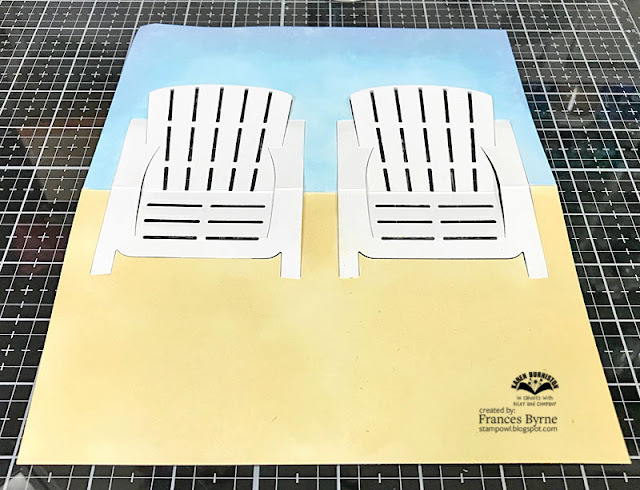 To create this pop-up where you have two adirondack chairs popping up, you need a wider die cutting machine that will accept a 8 1/2 inch wide card. The size of my card is 7 1/2 inches x 9 inches and then scored and folded along the 9 inch side to create a 7 1/2 inch x 4 1/2 inch folded card. 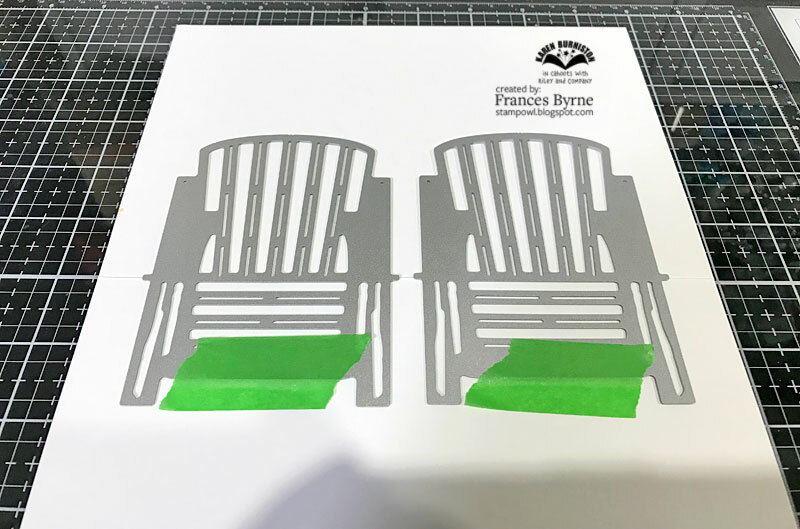 As I am lucky and have two adirondack chair die sets, I was able to place both in the centre fold of my card and run them through my die cutting machine at the one time. But you can still do this if you only have one die set which most would just by die cutting one, and then moving the die to the other position and running through again. That is how I had to do it for my original card I made years ago. After die cutting the adirondack chairs, I masked both chairs and then created my beach (sand) and sky using Distress Oxide inks. 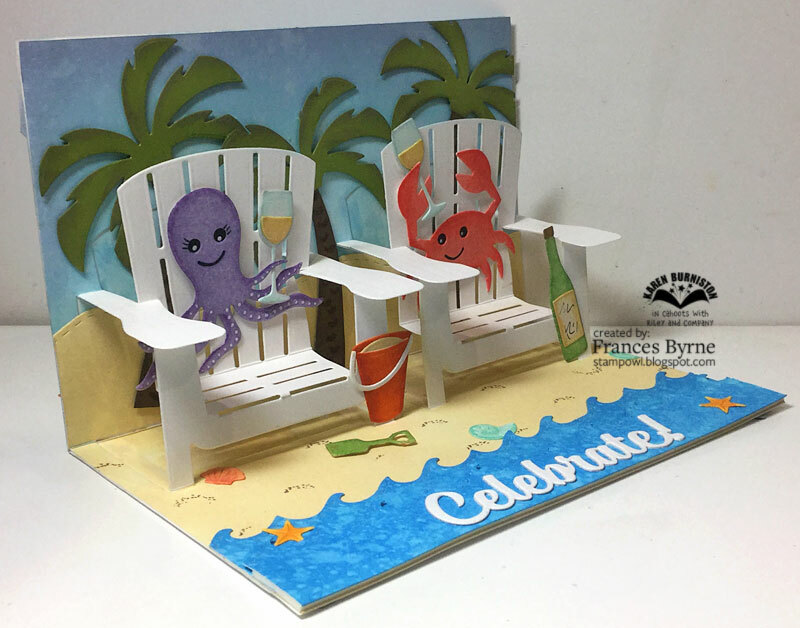 To decorate the inside of my card I used the bucket and spade also from the Adirondack Chair Pop-up die set. The palm trees behind the chairs are from the Palm Tree Pop-up die set. 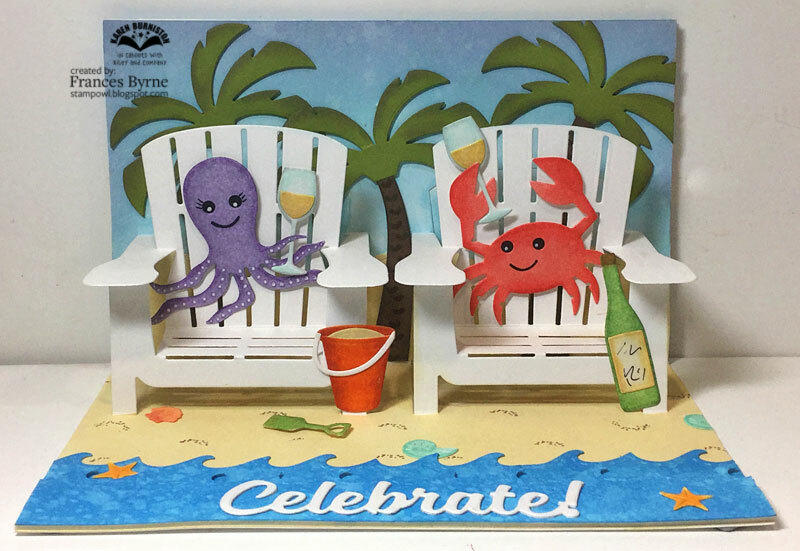 Sitting on the chairs I added the octopus and crab from the Ocean Animals die set that are both enjoying a drink. The glasses and bottle are from the Wine Charms die set. The sand on the lower back of the card (behind the chairs) was created by using the sand/dirt border die from the Nature Edges die set. As my card is longer than the actually die, I had to die cut it once and then reposition it to create a longer border. The ocean waves on the front edge of the card was created using the wave border from the Tropical Scenes die set. Again this border needed to be extended. To finish off the inside of the card I added the Celebrate sentiment. As the focus of this card is on the inside of the card I kept the front fairly simple, repeating some of the elements I used on the inside of the card. The sun is also from the Tropical Scene die set along with the waves. To finish off the card I added the Cheers sentiment.